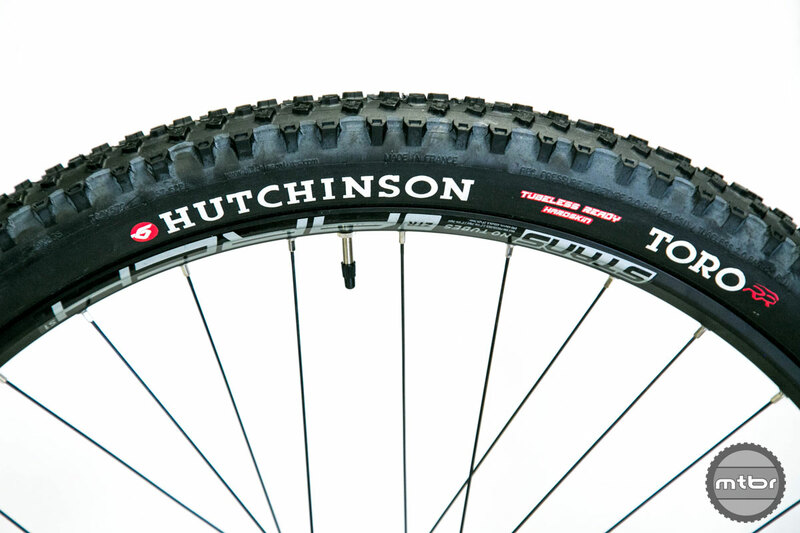 The Hutchinson Toro is a tire that can excel in a wide variety of conditions. Among the French tire maker’s most versatile offerings, the Hutchinson Toro has tall evenly spaced knobs designed to deliver neutral handling. Center knobs are slightly shorter for better mud clearing, while side knobs get a little more height for enhanced cornering grip. 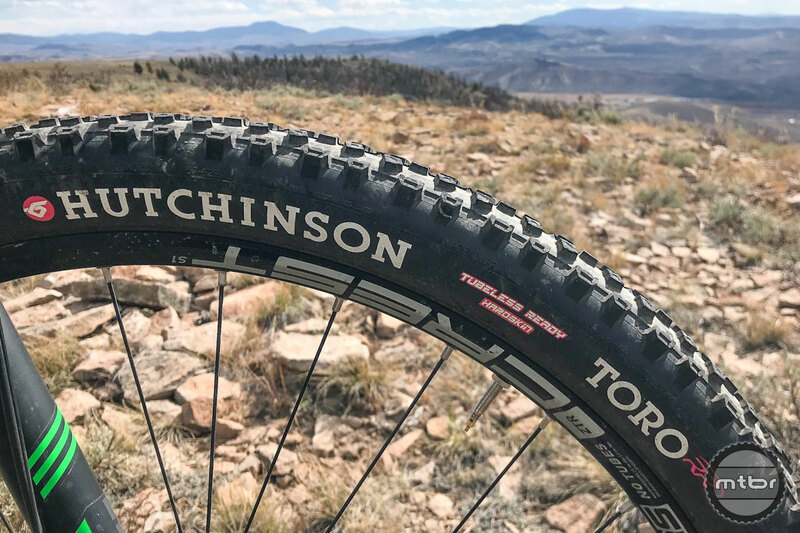 All told, the Hutchinson Toro comes in 29 different versions, including everything from 24×2.0’s for recreational use, to a variety of enduro/downhill models, to the 29×2.35 tubeless ready XC tire that Mtbr tested here. 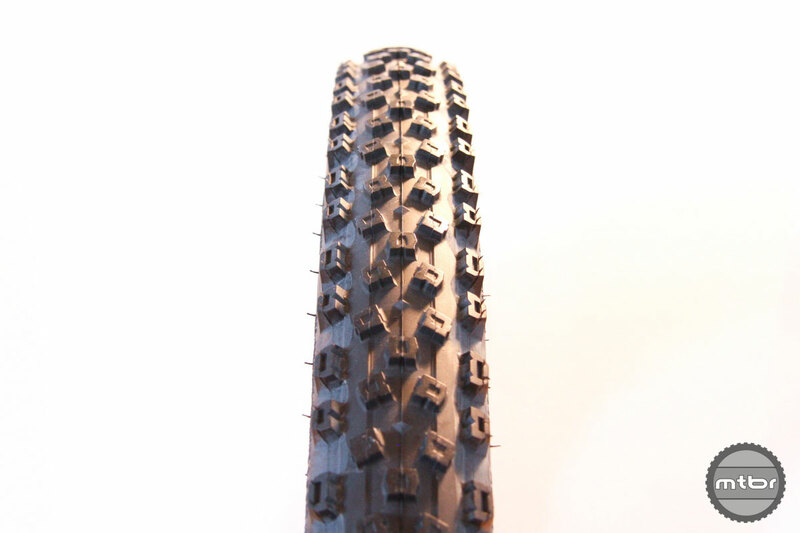 This $60 tire has a claimed weight of 750 grams, has Hutchinson‘s Hardskin bead-to-bead reinforcement, and is made from Hutchinson’s Race Riposte triple compound, where the center treads are harder, edge tread is softer, and there’s a layer under the tread that’s claimed to better support the center to increase speed. While not a pure-bred XC racer, the Hutchinson Toro has no problems holding speed. Like all of the company’s aftermarket tires, the Toro is produced in Hutchinson’s own factory in France, allowing for greater quality control. It’s considered an all-around offering that’s directional specific for front or rear use. Casing is 66 tpi. All told the Hutchinson Toro is available in 29 different configurations, including this 29×2.35 model with Hardskin bead-to-bead protection. On the Mtbr Park Tools DS-1 Electronic Scale the Hutchinson Toro weighed 762 grams (12g over claimed weight). 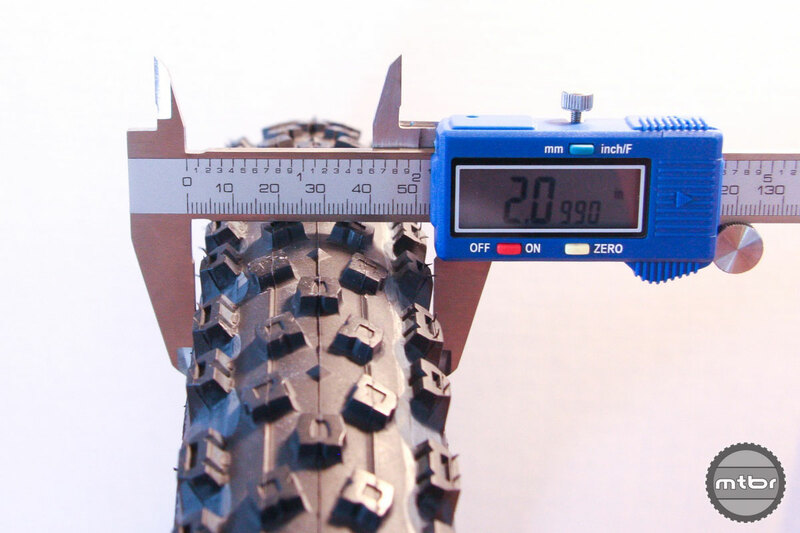 When mounted on a Stan’s ZTR Crest S1 aluminum wheels, which have a 23mm internal rim width, actual width measured by the Park Tools DC-1 Digital Caliper was 2.1 (versus the advertised 2.35). 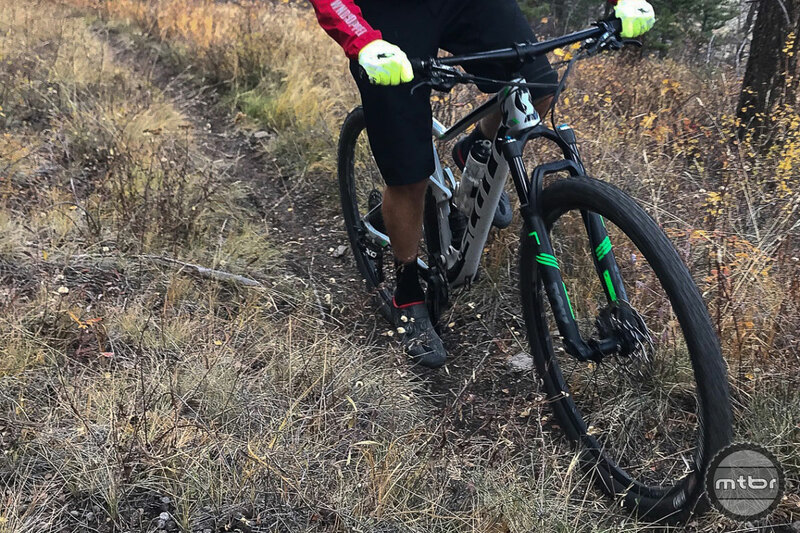 Mtbr tested the Hutchinson Toro on a variety of trail types, including hardpack, loose over hard, and softer high alpine dirt. Keep reading to find out how it performed. Transition knobs are angled to match the breakaway angle of the tire for either drifting the rear or steering from the front. The Hutchinson Toro has been around for a long time — and for good reason. 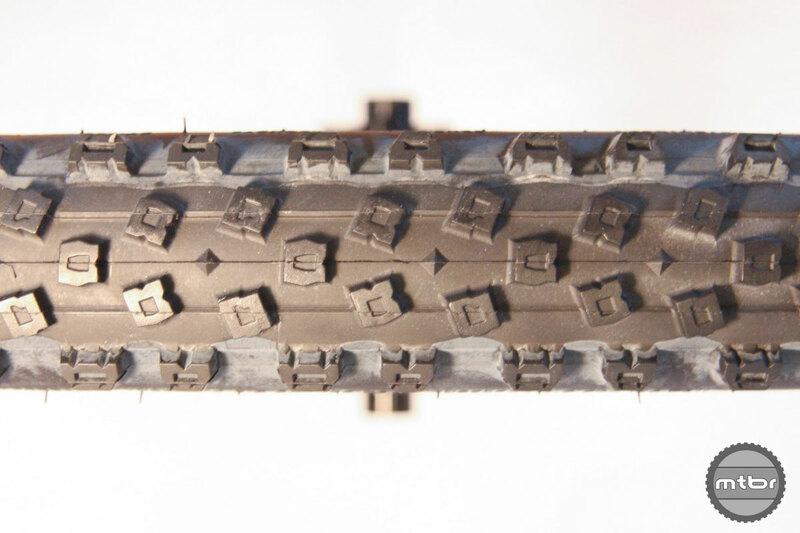 Depending on size, width, and compound, it’s a tread pattern that can excel in a variety of uses, ranging from full tilt XC racing to hard charging trail and enduro riding. Knobs are evenly spaced, with shorter and harder tread running down the center to enhance rolling speed, and softer, taller knobs along the edges to dig in when cornering. 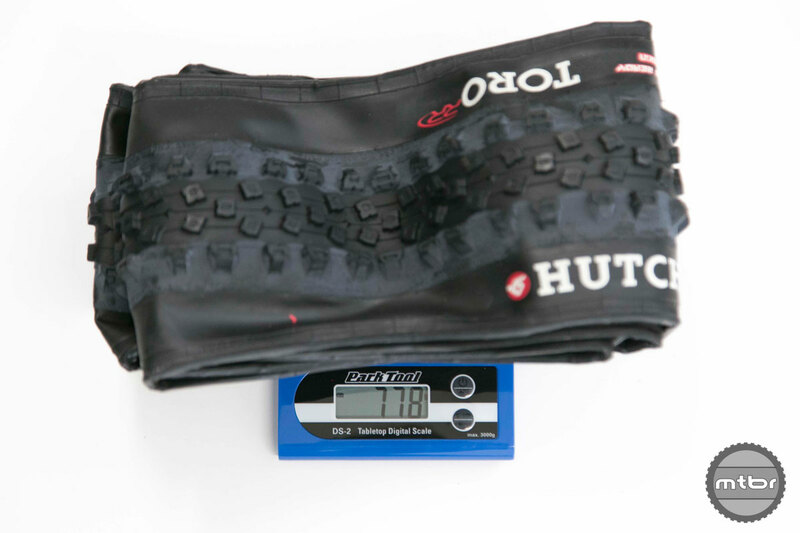 Our tester Hutchinson Toro weighed in at 12 grams above the claimed 750 grams. Initially, though, the Hutchinson Toro was not overly impressive. 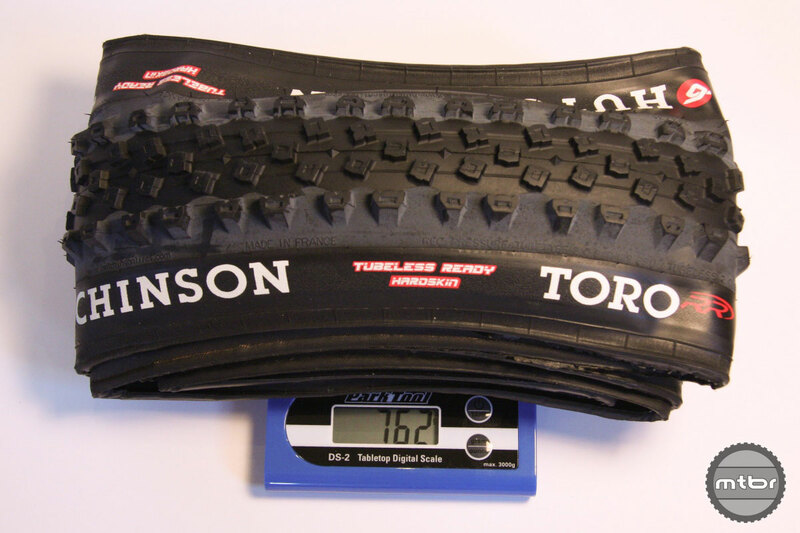 Our 29×2.35 test tires weighed 12 grams more than the claimed weight, yet measured just 2.1 inches wide when mounted on a test set of Stan’s ZTR Crest S1 wheels with 23mm internal rim width. The set-up bordered on silly looking on our Scott Spark 900 test bike with boost hub spacing. You could almost squeeze two Toros between the fork legs. But once out on the trail, the Hutchinson Toro punched well beyond its width. 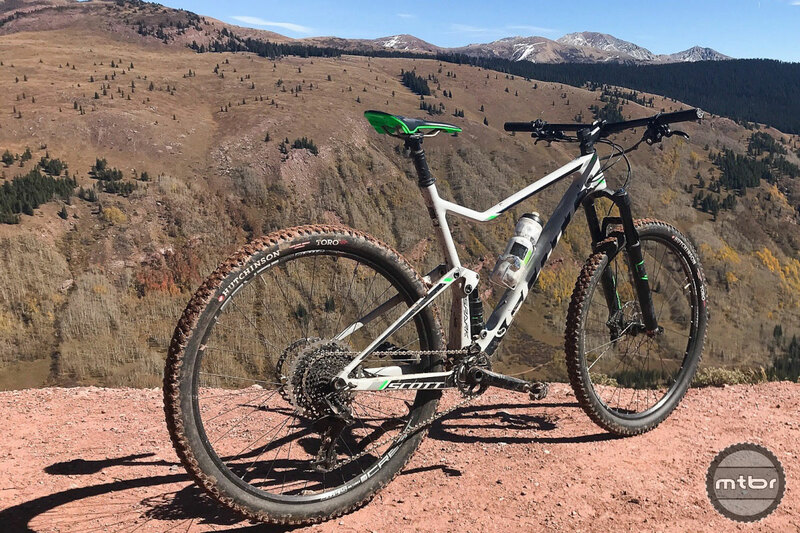 During testing on a variety of trail surfaces it rolled reasonably fast, yet still confidently hooked up on loose, loose over hard, and soft and sloppy terrain. 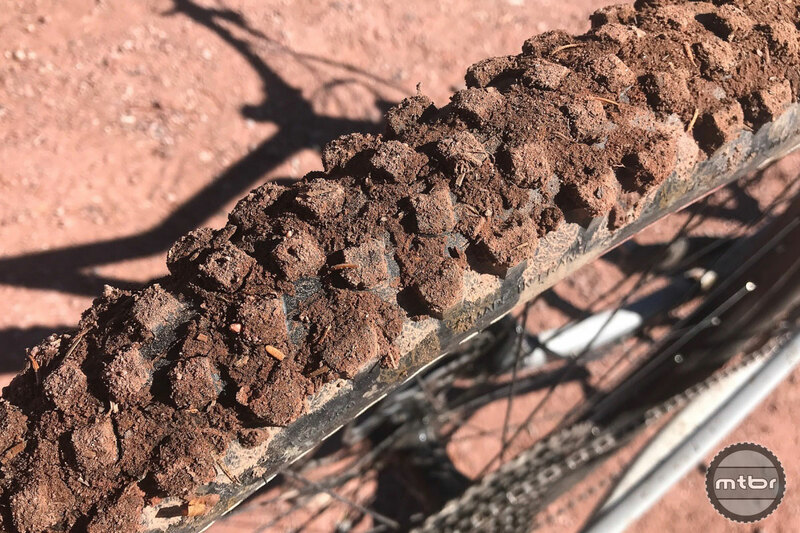 The tire also did a commendable job maintaining traction on the occasional wet root and rock, so long as rider weight was kept balanced over the bike. Side knobs are a tad taller than the center tread, which makes it easier to find edge grip when cornering on the Hutchinson Toro. And while we haven’t yet logged enough test time to speak to true long term durability, after about 150 miles on dirt both center and side knobs held up well, with only minimal signs of wear. And there’s been nothing even close to a puncture despite running pressures in the mid/low-20s and suffering some fairly abrupt square-edge rock strikes along the way. I can’t even find much scratching on the sidewall at this point. Mud-shedding ability was just so-so. 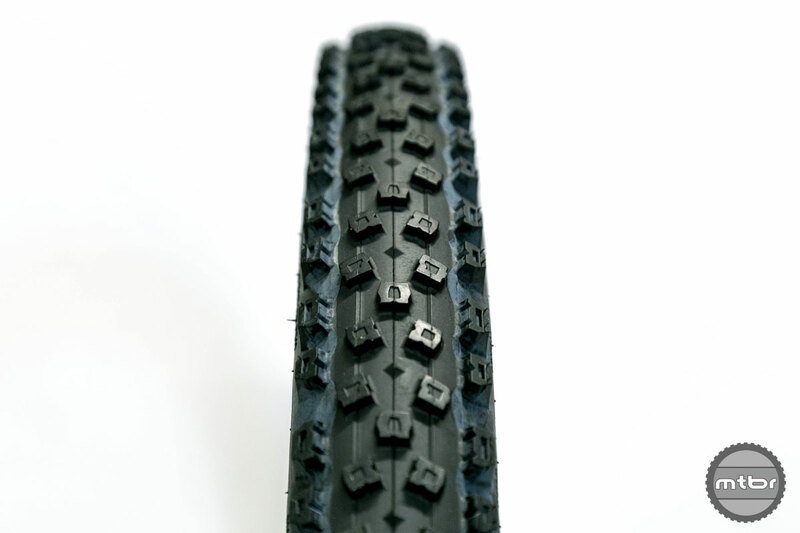 Tread design is interesting. The center blocks are set at off angles and have a small depression in the middle, resulting in a second edge when rolling in a straight line. The center tread spacing is also far enough apart that the casing can flex ever so slightly when clawing up steeper rough surfaces. There are also small diamond-shaped nubs in the empty spaces along the tire’s center, which are intended to provide a little extra protection if you smash a sharp rock just right. 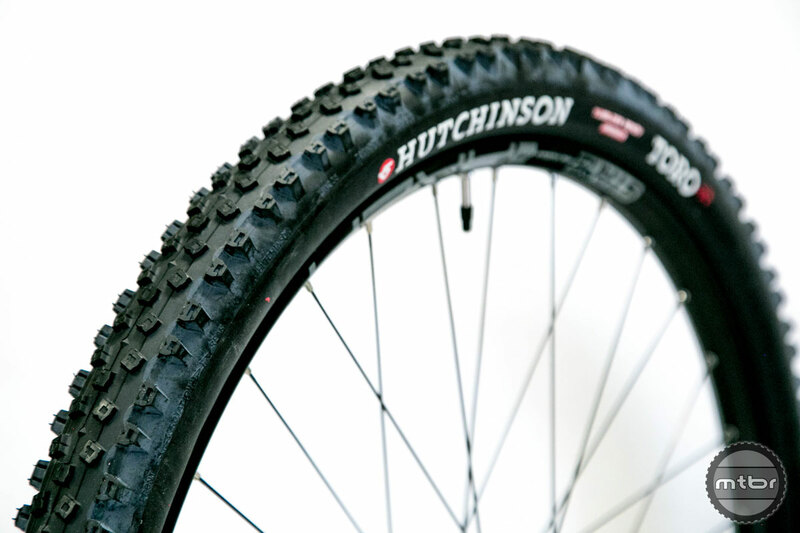 The tread on the side of the Hutchinson Toro features a deeper cut-out and recesses that are designed to add some flexibility for better overall traction. And perhaps coolest of all, all the transition knobs are set at an angle that matches breakaway angle of the tire for either drifting the rear or steering the front. Overall it’s a relatively flat profile, meaning there’s no drifty transition zone, and you quickly reach the edge blocks when cornering. Actual width of these “2.35” tires was a tad disappointing. Braking grip was good both in a straight line and when leaning over, and as long as rider weight stays reasonably centered over the bike, they maintain traction on steeper, technical climbs. 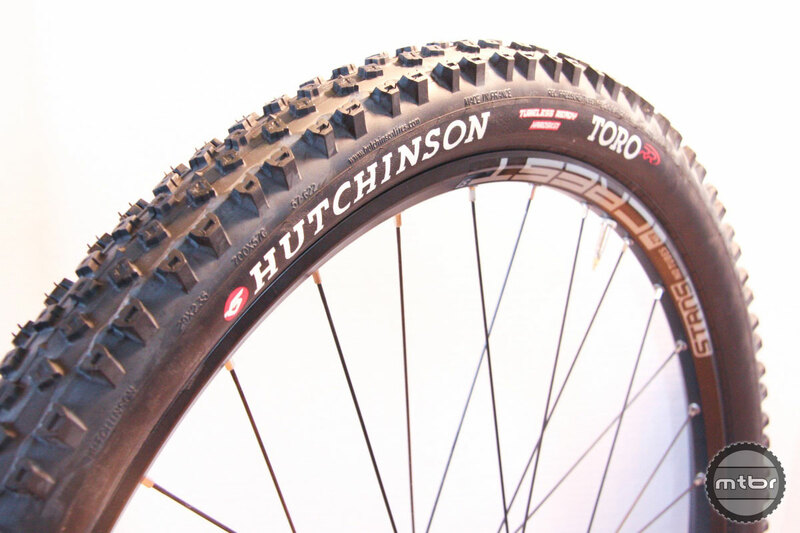 The Hutchinson Toro tires are directional specific, though for pure XC use we’d likely use a Toro up front, but look for something a little faster rolling on the rear. 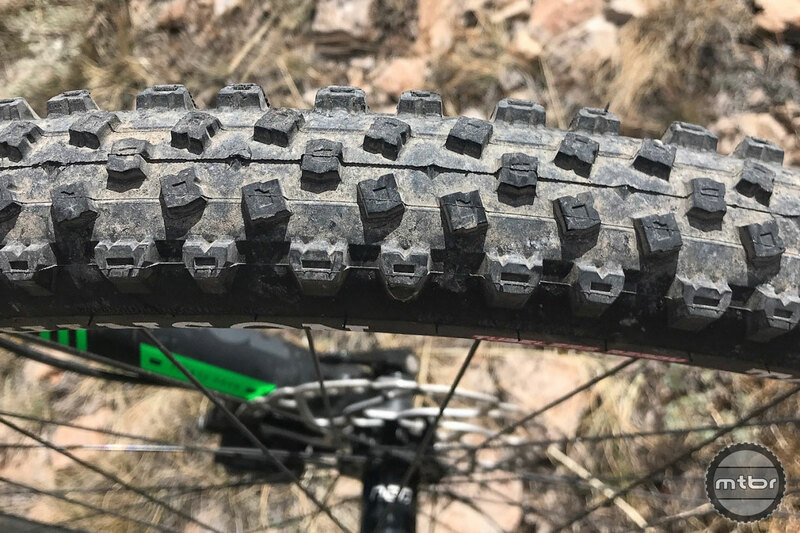 Bottom line, this is a tire with a wide performance window that can hold speed on smooth hardpack terrain, but still dig in when things get a little damp and dicey. We just wish it was a little wider. Then it might find a home on our trail bike, too. Side knobs are a tad taller than the center tread, which makes it easier to find edge grip when cornering. All told the Toro is available in 29 different configurations, including this 29×2.35 model with Hardskin bead-to-bead protection. 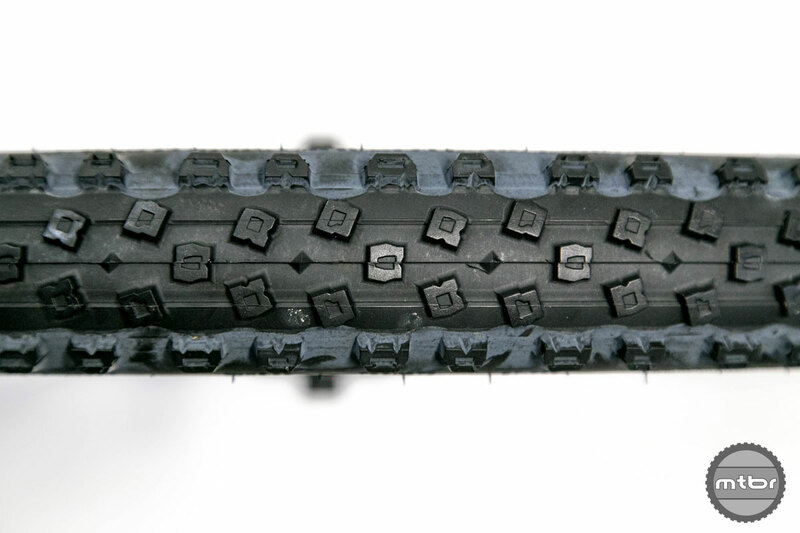 The Toro is a tire that can excel in a wide variety of conditions. While not a pure-bred XC racer, the Toro has no problems holding speed. Our test set weighed in at 12 grams above the claimed 750 grams. Small depressions in the middle of the center knobs provide a second edge for traction and braking performance when rolling in a straight line.